The kitchen is the heart and soul of the house, so when you are considering giving it a complete new look, you want to work with trusted professionals. Cossentino and Sons has completed thousands of kitchen projects, leaving each client with a brand new room that serves not only as an area to prepare meals, but more importantly, a place where family and friends congregate and enjoy each other’s company. Your first meeting with our owner Wayne Cossentino will determine the scope and size of the kitchen remodeling project and establish a budget range. Once that has been approved, the design stage begins. The most challenging part of a kitchen project is where to start and what to select in terms of appliances, fixtures, colors, cabinets, countertops, lighting, and flooring – virtually every part of the room. We can help you escape “analysis paralysis” by providing professional advice, insight, and guidance. 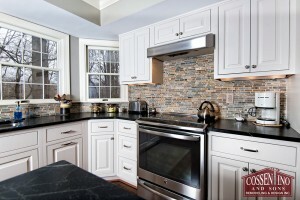 Our kitchen designers will work with you to bring a dream to life effortlessly. By meeting with our designers at the showroom you will find the latest in brand name, high-quality appliances, fixtures, cabinets, and flooring. We have found that our clients gain a great deal of knowledge, and successfully narrow down their options, by being able to see and touch the items in the showroom. A 3D rendering of the design concept will be produced, bringing you one step closer to reality. After all of the selections have been made, a detailed Contract Proposal will be prepared for your approval. The construction process then begins and we do our best to stay on schedule so your family can return to their normal routine as quickly as possible. 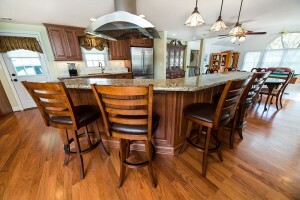 The completed project will bring new life to your Kitchen gathering area. Cossentino and Sons is based in Howard County and we service customers in Baltimore, Carroll, and Anne Arundel counties, along with parts of Northern Montgomery County. If you are interested in working with experienced professionals who pay attention to detail, contact us today at (410) 442-0000 or email us today.